Alluring sculptures that Kyle Bendle, pictured here, creates with fellow artist Brad Bolte are part of this year’s Green Gift Fair at Community Forklift. The fair lasts through Dec. 29. That’s a familiar six-word question for Brad Bolte and Kyle Bendle. And the Washington, D.C.-based artists know it will be on the tip of the tongue of anybody spying their alluring wood sculptures at this holiday season’s Green Gift Fair at Community Forklift. The duo’s answer? Teamwork. And an incredible amount of patience and experimentation. For starters, Bendle sketches his intricate and original designs on paper before using specialized software to digitize them in three dimensions. Then, Bolte painstakingly transfers each point of that “blueprint” to the software that signals the inanimate member of their joint venture—the CNC, which is short for computer numerically controlled mill—how exactly to transfer that complex image to a block of wood. The mill is basically a router on steroids. But its trio of axes—good ol’ x, y and z for those who remember their trigonometry—aren’t magic. 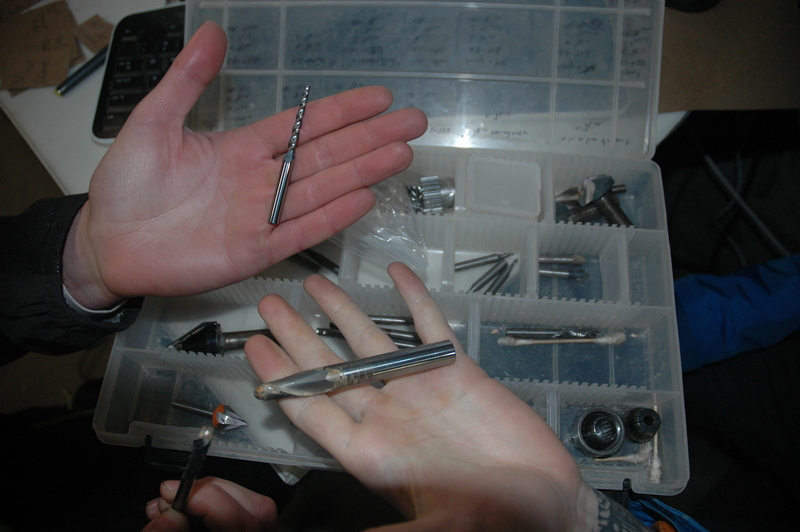 First, Bolte has to fit the machine with the right series of carbide bits to carve out the three-dimensional curves first envisioned in Bendle’s head. Bolte starts with a rough cut and refines it until reaching the desired effect. What finally emerges is mesmerizing. The abstract and pleasing results are what you might expect to see if Cubists wielded drill bits instead of paintbrushes. Raised patterns hewed into chunks of reclaimed maple, Douglas fir, oak, black walnut, cherry and mahogany vaguely resemble a topographical map. Some conjure up landscapes as diverse as the eroded Badlands of South Dakota, the layered sands of the Sahara Desert or the braided strands of the McKinley River in Alaska. But use your imagination. Others might be tornadoes, wind-whipped snowdrifts or a troupe of supple dancers in motion. 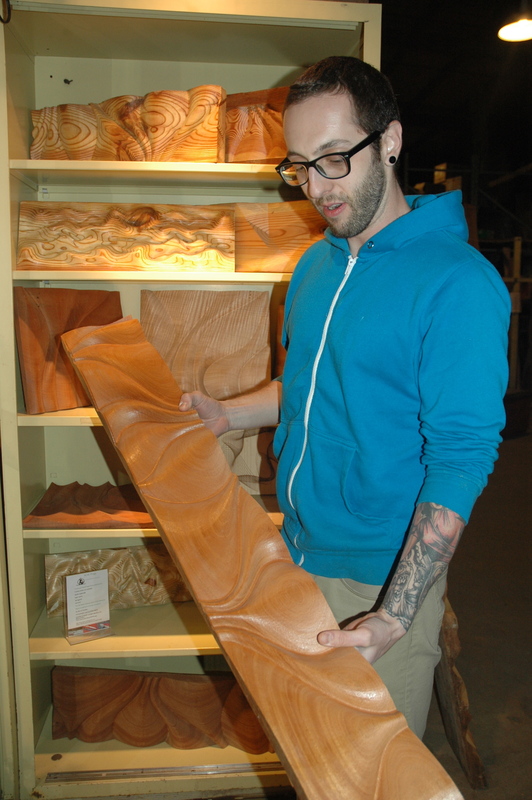 Brad Bolte, left, and Kyle Bendle ham it up at Playshop, their joint venture in Washington, D.C. The image on the computer screen is a “blueprint” for one of their three-dimensional wood sculptures. Exposing the wood’s innards causes the wood’s grain patterns to really pop. That texture, enhanced with a light coating of polyurethane, invites observers to employ their eyes, hands and brains. They can’t help themselves. 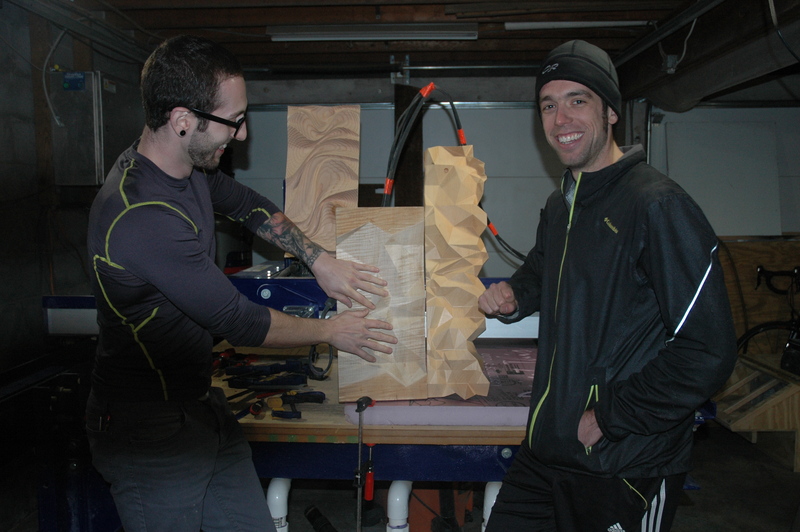 The two Playshop entrepreneurs use bits of all shapes and sizes to craft their three-dimensional wood sculptures. Their version of what might be called super-advanced whittling in the computer age takes place in a two-car garage in a Glover Park alley. At the beginning of the year, they converted it into a space they’ve christened Playshop (www.playshopdc.com), the anti-workshop for this pair of adventurous, curious and talented 20-somethings. This art and design studio with a focus on digital fabrication is where they also craft offbeat signs, furniture and an ever-expanding inventory of other eclectic items. Trial and error and not fearing failure, they say, are their best teachers. Much of the wood, including every piece they are selling at the Green Gift Fair, is harvested at the Forklift because it fits with the pair’s upcycling ethic. Bolte discovered the Forklift during one of his deep-dive online research sessions—and bookmarked the Web site after reading about the 34,000-square foot warehouse loaded with affordable and one-of-a-kind materials. Artists Kyle Bendle, left, and Brad Bolte journeyed to Baton Rouge, La., last spring to pick up a second-hand computer numerically controlled mill that is the centerpiece of their Playshop studio. Bolte, a native of northern New Jersey, and Bendle, who hails from southern Maine, migrated to the nation’s capital several years after securing jobs at a mega architectural firm that specializes in corporate projects. They met at Roger Williams College in Bristol, R.I., where they both enrolled in a six-year program that earned them master’s degrees in architecture. The friends bonded in what ended up being their favorite class, a graduate course called digital manufacturing. Shortly after arriving in D.C., the pair started scheming the where and how on Playshop. They already knew the why. One of their biggest investments involved a memorable weekend road trip to Baton Rouge, La., to pick up the cherished CNC mill that is the centerpiece of their venture. Bendle, who grew up surrounded by artists and illustrators, gravitated toward the design and modeling side, while Bolte, who comes from a family of engineers, made fabrication his forte. The decision to launch Playshop about lined up with their joint decision to leave corporate architecture behind. Bolte, an athlete in college, now teaches tennis all over the metro region. Bendle makes his living doing freelance architectural design. They live with a handful of other housemates in the Adams Morgan neighborhood. 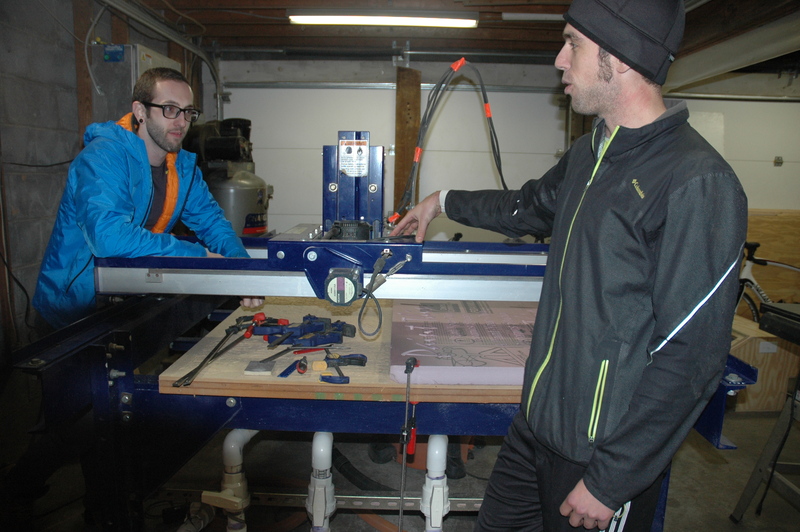 Kyle Bendle, left, and Brad Bolte, who met while studying architecture, use reclaimed wood from Community Forklift to create their unique sculptures. Both are reluctant to turn Playshop into a business or full-time job because they fear it will kill the joy they’ve found by heeding their hearts. For now, they are content to release old wood’s inner elegance without expecting a paycheck as a reward. Bolte, 28, says it really scared him to think about spending the next 30 years of his life trapped in corporate culture. Now, he feels as if he can breathe more freely. Bendle, 27, agrees that he feels equally liberated. Until leaving his steady job, he says, he pretty much did what he was told would help him meet the traditional standards of achievement. 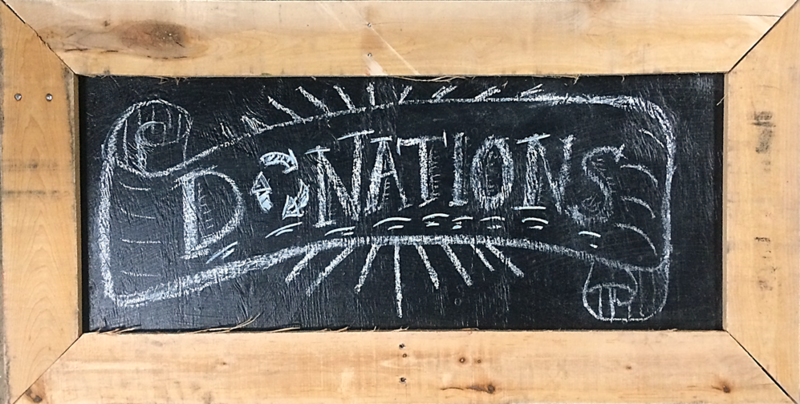 * The Forklift’s fifth annual Green Gift Fair, which runs through Dec. 29, features the handiwork of 35 organizations and individuals. Playshop sculptures start at $100, while prices for other items in the fair start as low as $1. In addition to wood sculptures, gift seekers will find an assortment of eco-friendly an affordable green-themed paintings, clothing, metalwork, woodcrafts, toys, baby gear, beauty care products, candles, greeting cards, housewares and stained glass mosaics. Some of the artists will be sharing their skills with Forklift fans during workshops scheduled for select weekend afternoons.